Friends, today I give you a guest post from Nicholas L. Syrett, my BFF and neighboring historian in Northern Colorado. 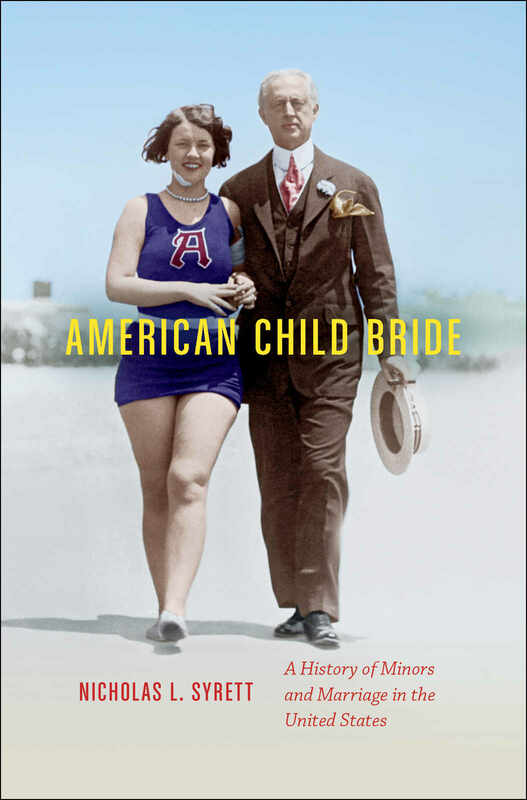 His second book is out now–American Child Bride: A History of Minors and Marriage in the United States. (That’s the cover on the left, featuring a striking photo of “Peaches” and “Daddy,” a.k.a. Frances Heenan Browning and Edward West Browning. They were among the biggest tabloid sensations of the 1920s–she was 15, he 51. when they married in 1926.) Here below, Nick gives us some of the deep history behind anti-child marriage activism in the U.S., and concludes with some thoughts about a 70-year old presidential candidate this year who as he gets older, marries women who are younger and younger. What does age asymmetry in marriage say about gender roles in our era? When most Americans hear the phrase “child marriage” they probably think about it happening elsewhere: India, Africa, the Middle East. The practice is indeed widespread in other parts of the world but thousands of legal minors marry in the United States every year as well. Every single state allows teenagers below the age of 18 to marry with some combination of parental or judicial consent. In some states the minimum marriageable age goes as low as 12. All of this should concern us. But as I discovered in researching my new book, American Child Bride, these have been longstanding concerns of feminists in the United States. 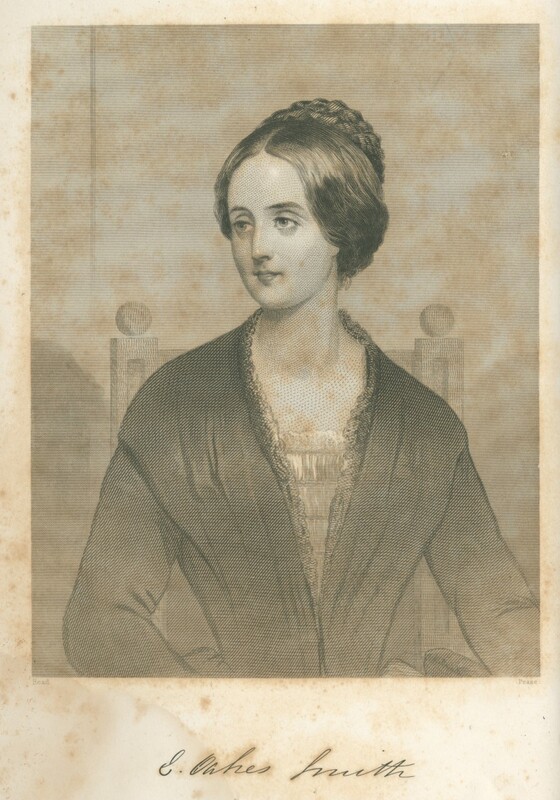 Among women’s rights advocates of the mid-nineteenth century Elizabeth Oakes Smith (1806 – 1893) was the foremost opponent of the marriage of legal minors. She is now largely forgotten by most scholars of American feminism, but she was quite influential in her day. She published widely, including poetry and fiction, spoke on the lyceum circuit, and authored a series of columns in the New York Tribune that she called “Woman and Her Needs.” They were collected and published in 1851 in a book of the same name. Smith had been married herself at age sixteen in her native Maine and as she explained in the unpublished autobiography she penned late in life, it was “the great life-long mistake.” But it was a mistake that she had been pressured to make by her parents and her fiancé, at a time when she believed she should not have been capable of consenting in the first place. Feminists like Smith pointed to inconsistencies in the law of marriage—in almost all states, the age of consent to marriage was lower for girls than for boys beginning in the colonial era, and in almost all cases girls could marry before age 21, the age of majority for most of our history. This meant that all girls were capable of consenting to marriage before they had reached legal adulthood. And in some states in the middle of the nineteenth century (the first moment when reliable vital statistics are available), upwards of 40% of all female-bodied people who married did so as legal minors. Before these girls could enter into any commercial contract or make a will they were perfectly capable of entering into the one contract that, in almost all cases, lasted a lifetime. It was also a contract that, because of coverture, evacuated adulthood of almost any of its legal significance. While it is clear that marriage was one of the only ways that a girl (or boy) could legally emancipate herself from her parents, which was useful if one lived in an abusive home, in the aggregate early marriage moved girls seamlessly from dependents in their fathers’ households to dependents in their husbands’. Marriage turned girls into “perpetual minors,” to use the phrase favored by many women’s rights activists at the time. Now, here is a contract. One party is mature in life—experienced not only in the world, but in the nature of his own soul, its needs, its capacities, infirmities, and powers. The other party is a child, an infant in law, whose pen to a commercial contract would be worthless … Yet this girl, this child, is party to a contract involving the well-being of her whole future life; a contract by which she is consigned to sickness, care, suffering, coercion, and her individuality completely suppressed. Smith went on to indict any man (which would presumably have included her own husband) who would enter such a contract with a legal child, precisely because he was availing himself of her inexperience in gaining her assent to the marriage in the first place. Elizabeth Oakes Smith was not alone. Activists like Lydia Pierson, Elizabeth Cady Stanton, and members of the influential Blackwell family also focused on the intersection of age and marriage in their crusade for women’s rights, and following the passage of the Nineteenth Amendment, members of the National Woman’s Party also worked at the state level to equalize minimum marriage ages state by state. American Child Bride argues that age provides a crucial way to reexamine the history of marriage law in the United States, and indeed the history of legally gendered adulthood itself. And while the numbers of minor brides and grooms in the contemporary United States pales in comparison to their numbers even as recently as the 1950s, it remains the case that almost all American men continue to marry women who are younger than they. Age asymmetry in marriage is by no means a thing of the past and in its more extreme form it remains a way for older, wealthier, and more experienced men to maintain dominance within their marriages. We need look no further than the current Republican nominee for president, who has successively married women who are three, eighteen, and twenty-four years his junior. While none of Trump’s wives has been a legal minor at the time of her marriage, Elizabeth Oakes Smith believed that age asymmetry in marriage made it difficult for men to recognize “the entire individuality of Woman, her claims as a creation distinct, and one; not as a half—a supremacy—an appendage—a mere luxury for the delectation of man.” Marrying women solely for their youthful beauty establishes a dangerous precedent for the functioning of a marriage, and a woman’s place within it. ← Teaser Tuesday: How and why did Esther become Mali? Interesting post. I like how you have drawn this concept to the present to help readers understand this is real and it’s happening today. Thanks, Logan. Unfortunately many thousands of minors marry in the United States every year, all of them legally thanks to the exceptions written into our laws. Thanks for this post. A nonprofit in New Jersey called Unchained at Last is working on this issue. UaL focuses on American marriages arranged under religious patriarchy. Quel surprise, child brides suffer. I don’t know the organization well but I think it is pushing at the state level to raise minimum ages for marriage and close or lessen the parental-consent loophole that extends access to marriage for people younger than the minimum age. LadyProf: Yes! Unchained at Last has indeed been pushing this in New Jersey (a bill passed its judiciary committee in September) and a couple other states as well (Virginia passed legislation last year closing some of the loopholes) and the Tahirih Justice Center, which works on behalf of immigrant and migrant women and girls, has also been really active on these issues. Are you objecting to minors marrying, or to minors marrying people much older than they are? One of my brothers married at 18. His wife was 17, and he had to become her legal guardian for the wedding to take place. The marriage did get her out of a pretty bad family situation, and my brother insisted that she finish high school (a matter of half a semester). Forty-four years later, they are still happily married, despite the doubts that my parents and nearly everyone else had about the wisdom of their choice. Hi Dame Eleanor: Smith herself was largely objecting to older men marrying younger girls, and I would agree with her. That said, when minors marry other minors, absolutely all the evidence suggests that those marriages are more likely to end in divorce. Your brother and sister-in-law are a happy exception to the rule! Professor Syrett, do you know the approximate median age of men who married minor women in the period on which you focus? Do you know the median age difference? Hi EngLitProf: The answer is tricky in part because most states did not keep track of these things systematically till well into the nineteenth century, and some did not do so until much later than that. Generally speaking the median age difference was not extreme, though in almost all cases men were older than women. My book covers the late eighteenth century till the early 21st, and I focus more on the incidence of the marriage of minors themselves (girls and boys) rather than the differences in the ages of the two parties, though I definitely do discuss this as an issue for feminists and reformers. I’m also working with a case, in the archives, of a child bride, a 15 year old girl who married, probably with parental assent, and to a 24 year old, not 74, but as was predictable even then, nothing much went well, much less happily ever after. I’ll be interested reading this to see what else to make of it. My case played out c. 1804-1811, ish, in New York and Louisiana. Although, in fact, as I think of it, it probably played out until the death of the ex-wife, in 1872. Thanks, everyone, for your comments and questions. Full disclosure: Nick and I are friends, but I don’t feature every book by every friend on my blog! In fact, when I write about books I usually write about those that interest me particularly and/or those in my field that stand out for their innovation, scope, and/or significance. Among the many things I admire about Nick and his books is that (and I’ll just say this outright): unlike most modern U.S. historians, Nick is a scholar who really thinks about the longue duree. This is especially impressive to those of us who work in the period before 1800, when it’s typical for us to write books that cover 100 years or a few centuries, or a millennia, or so. In fact, Nick’s books are even bigger than mine in terms of years covered–I’m an early Americanist, and my first book covers 150-160 years, but my second is a biography and so spans just one century, the eighteenth. Both of Nick’s books–American Child Bride and The Company He Keeps: A History of White College Fraternities (reviewed on this blog here)–cover the nearly the entire U.S. national period, from the late eighteenth or early nineteenth century to the present. His work therefore makes truly significant contributions to the history of masculinity, gender, sexuality, the family, and childhood & youth. This is undoubtedly because he was trained as a women’s & gender historian, and as we all know, we usually have to keep expanding the temporal boundaries of our work in order to say we found some change over time–or any important change at all! But it’s also because Nick is among the most dedicated and purest historians I know. My man works really hard, and he’s always writing something. He really puts me to shame! Thanks Ann! I think what interests me about the longue duree is, exactly as you note, the change over time. In order to find that in the everyday behavior of not otherwise noteworthy people of the past, one has to use a pretty wide lens. This book is “in the building,” and “in process” by the bibliographers and cataloguers in the library at Penn. I just “expedited” the processing, which means that it’s two business days from the shelf! Wonderful! Thanks so much Indyanna! Most of the early marriages in my wife’s large family have not worked out although that of the nephew who married his pregnant girl friend when he was twenty-one and she was still in high school has endured.